As part of the Center for Agroecology & Sustainable Food System's First Fifty Book & Film Series, CASFS welcomes Nina Simon for a reception and presentation about her new book, The Art of Relevance. The reception begins at 5:30 pm, with the presentation and Q&A session from 6:30 - 7:30 pm. We all want our institutions to be "relevant." But what does that word really mean? In this talk and book signing, Santa Cruz Museum of Art and History executive director Nina Simon will share inspiring examples and practical theories on how to make your work more vital and valuable to diverse communities. 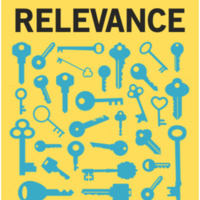 Relevance isn't about what's #trending. It's about unlocking meaning in people's hearts. Join Nina for a thought-provoking conversation about how we can use relevance to matter more to more people. Join us for a thought-provoking presentation and discussion with Nina and explore how forward-thinking organizations maintain relevance in a shifting culture.